UN Secretary General Ban Ki-moon on Friday expressed grave concerns about the intensifying conflict in Ukraine after Kiev and the West said Russian troops were actively involved in fighting in the country's east. His comments came as the United Nations said in a report that nearly 2,600 people had been killed by the conflict in eastern Ukraine since mid-April. "I'm gravely concerned by the deteriorating situation in Ukraine," Ban told a UN conference on the Indonesian resort island of Bali. He said recent talks aimed at resolving the crisis had "quickly been overshadowed by alarming new reports of intensifying fighting". Ban said he was concerned about the situation on the Ukraine-Russia border, and reports that arms and heavy weaponry were flowing into Ukraine from its former Soviet master. "There is an urgent need to ensure a secure border between the two countries with international verification," he added. 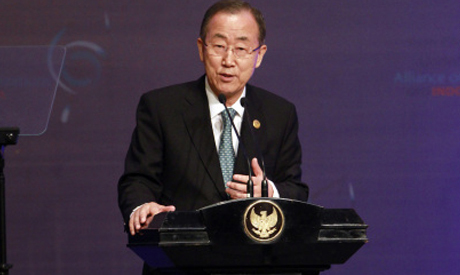 Ban also said it was critical that early parliamentary elections scheduled for October 26 in Ukraine go ahead. "We have to redouble our efforts to solve the conflict in Ukraine, lives are at stake, peace in Ukraine means peace in the region and beyond," he said. Ukraine and the West on Thursday said Russian troops were involved in the fighting tearing the east of the country apart, raising fears of a direct military confrontation between Kiev and Moscow. NATO said at least 1,000 Russian troops were on the ground supporting pro-Kremlin separatists who have been fighting against Kiev's rule since April. The United States and European Union have imposed a series of sanctions on Russia over the Ukraine crisis, the worst standoff between Moscow and the West since the Cold War.